Bullying can occur anywhere, and it may be even more dangerous when the child is on a school bus and cannot walk away from the situation. 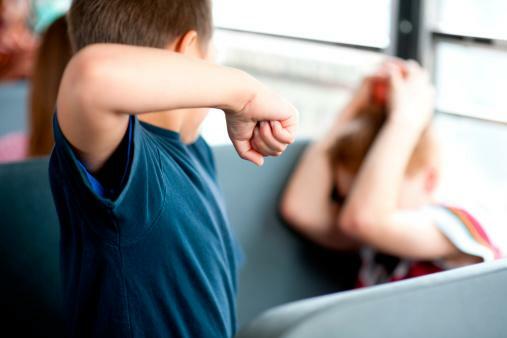 Better understanding of school bus bullying can lead to finding immediate helpful solutions that prevent any further harm to the child and hopefully eliminate the situation for other children, as well. For bullies interested in picking on their peers, the school bus is the perfect spot. It can be challenging to supervise so many students at a time, especially if the only adult present is the bus driver. When a child is picked on while riding the bus, he or she has no way of leaving the situation and protecting himself. Because the same children typically ride the bus based on location, bullies can count on targeting certain individuals on a daily basis. This puts students in a vulnerable situation. Students who are being bullied may not be willing to approach adults for help. There are several common symptoms many such children may display. Keep in mind not all kids react the same way, and their reactions can range from mild to severe. 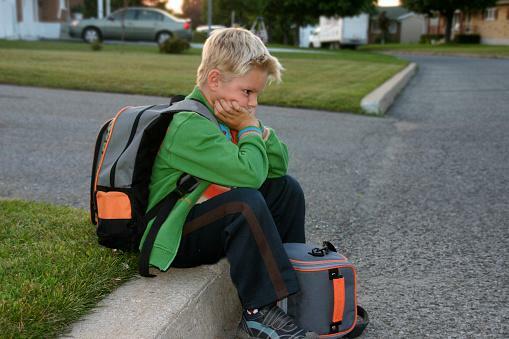 School bus bullying can cause a typically happy child to feel down, upset, anxious, and isolated. With the help of bus drivers, parents, and the school, there are many solutions and preventative actions to take that create zero tolerance for bullying. Sit as close to the bus driver as possible and on the right-hand side of the bus so they are visible to the driver. Pair up with a neighborhood friend and ride the bus together. Be polite to someone who tries to bully them rather than reacting with anger; fighting back should never be an option and will only make the situation worse. Tell adults when bullying happens, including parents, teachers, and the bus driver. Stand up for other students who are being bullied to keep it from spreading. Join a support group for kids who have experienced bullying. If your child is being bullied on the bus, you are not helpless. Check the school's bullying prevention policies and report incidents to the proper officials. Keep the student's name confidential to avoid increased bullying. Be a good listener to encourage the child to tell adults if an incident occurs. Discuss possible resolution options with the child so she feels like she is part of the solution. Be a good role model by avoiding road rage and other driving related intimidation tactics. Never blame the child for being bullied. Discuss with the child how you, the parent, can help him feel safe again. Encourage open and honest communication with daily emotional check ins. Avoid encouraging retaliation or fighting and focusing on positive bullying prevention methods instead. Investigate alternative transportation, such as car pooling, biking, walking or a different bus route, if possible. If bullying is extreme and no solutions have alleviated the child's suffering, the parent may consider removing the child from the school temporarily or permanently. Consider allowing the child to take a phone to school in case he or she feels unsafe and needs to reach you. Form parent support groups to discuss the issue and come up with solutions. Schools also have the power to help in these situations. Teach compassion and kindness to all students beginning at a young age. Maintain a strict rule on no bullying whatsoever. Clearly define bullying for students, parents, and teachers, and encourage anyone who witnesses an attack to report it immediately. Immediately remove bullies from school. Have bullies take mandatory classes on behaving appropriately towards peers and fostering empathy. Bring in the bully's parents so they can be involved in the process. Be kind and understanding towards students who report bullying as it can take a lot of courage to do so. Make sure one adult, who is well versed in the dangers of bullying, provides bus supervision. Bus drivers can also help. Make it a point to get to know all the students riding the bus so reporting incidents is not an issue. Foster a positive experience for all students riding the bus. Be well-versed in the signs of bullying and check in with students who show symptoms. Encourage students to report directly to bus driver if they do not feel comfortable telling anyone else. Connect with the parents of the victim and the bully when a student is showing signs of bullying. School bus bullying can make school a torturous experience rather than a fun opportunity for learning. By recognizing the signs of bullying, knowing how to react to it, and getting involved in the prevention, parents, students, bus drivers, and schools can make a huge difference in protecting all students.